Nintendo has warned that use of the smartphone app "PokeCreator," which allows gamers to make super-powerful Pokemon characters, can make its games unstable. Nintendo warned Friday against the use of a smartphone app that can be used to create custom, all-powerful Pokemon characters for use in its handheld games. The Japanese game firm said that those who use the PokeCreator apps risk unstable gameplay or even rendering their software unusable. "If illicit Pokemon are used for games with a partner, there are cases where this will cause trouble for the partner, such as unstable game play and other negative effects," Nintendo said in a Japanese statement. PokeCreator offers apps for iOS and Android that allow gamers to create their own Pokemon, freely assigning attributes such as hit points, special abilities and attack strength. The site instructs users to temporarily change the DNS on their consoles to connect to its own server and download their mutant Pokemon for gameplay. 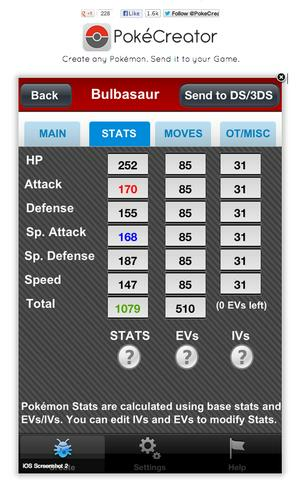 "Tired of endless Leveling up, EVs (Effort Values) training and Breeding? Want to be the best Trainer out there?" asks PokeCreator in its iTunes description of the short-cuts it provides around the steps usually needed to create a strong Pokemon character. The app, which currently costs 99 cents, says it works with any of Nintendo's DS or 3DS portable consoles. It says it is compatible with a number of Pokemon titles and currently has a four-star rating in iTunes. Nintendo said it will not restore systems that were damaged through use of the app. It said that gamers who use illicit Pokemon in its public tournaments will be automatically disqualified and banned from participation in the future. Pokemon, short for "Pocket Monster," is one of Nintendo's top global franchises, with two games from the series topping its all-time sales list for the Nintendo DS handheld. Gamers capture and train their Pokemon characters, then do battle with other trainers to progress. The games have a devoted fan base with their own quirky culture and have spawned TV series and movies.